Line 8-inch square pan with plastic wrap. Spread ice cream in pan. Freeze until firm, about 2 hours. Heat oven to 375°F. In small bowl, place 1/2 cup of the dry cake mix; set aside. In medium bowl, stir together remaining 1 cup cake mix, the cookie mix, butter and egg until soft dough forms. Shape dough into 24 (1 1/2-inch) balls. Roll in reserved cake mix, coating completely. On ungreased baking sheet, place balls 2 inches apart. Bake 8 to 10 minutes or just until set. Cool 1 minute; remove from baking sheet to cooling rack. Cool completely. Invert ice cream out of pan onto large plate or cutting board; remove plastic wrap. With 2-inch round biscuit cutter, cut 12 rounds from ice cream. For each sandwich, place 1 ice cream round on bottom of 1 cookie. Top with second cookie, bottom side down; gently press together. 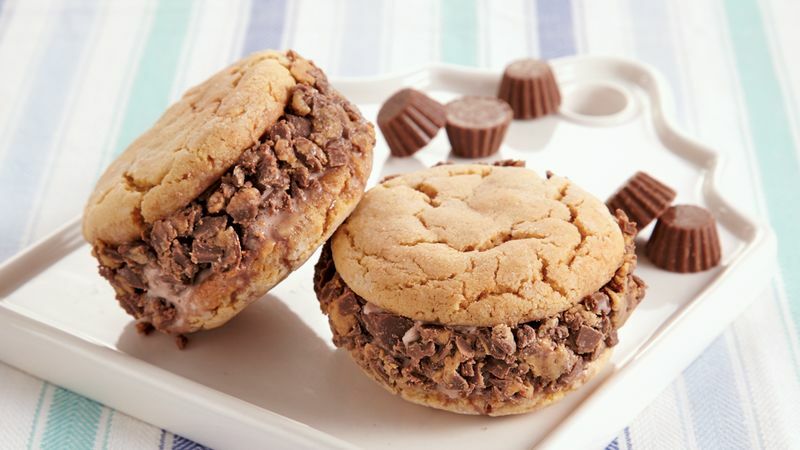 Roll edges of cookies in chopped peanut butter cup candies. Freeze 1 hour.